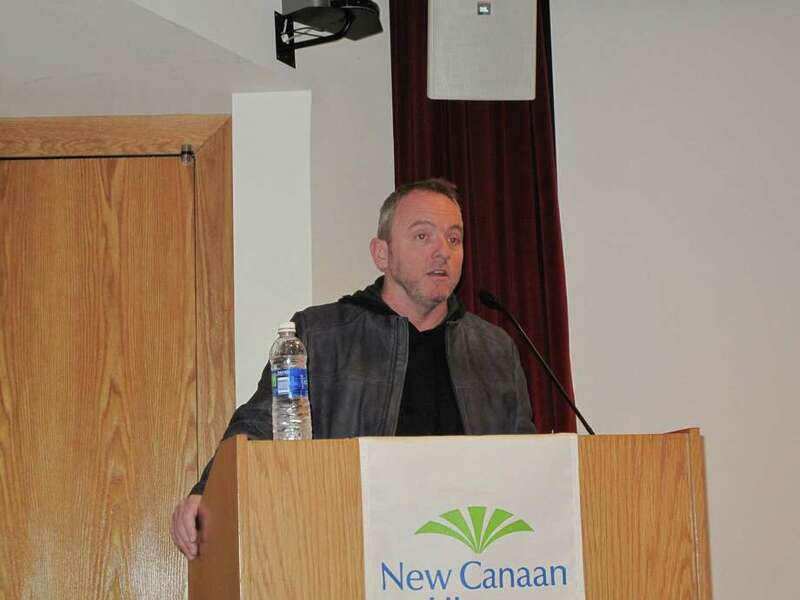 Author Dennis Lehane speaks at the New Canaan Library. 10/8/12. Acclaimed crime fiction novelist Dennis Lehane read from his latest book, "Live by Night," and answered questions about his writing regimen and outlook on life at the New Canaan Library Monday night. The event was sponsored by the library and Elm Street Books. Addressing a well-attended crowd of about 70 people in the Adrian Lamb room, the writer wasted little time, save for a quick joke about needing glasses now that he is in his 40s, before plunging into the fourth chapter of "Live By Night," captivating the silent audience with his even-toned reading. The book is set in Prohibition-era 1926 Boston. The main character is a 20-year-old "outlaw" who has just gone to jail. "His father is a police superintendent who is corrupt but in an oddly principled way. And he is principled in a corrupt sort of way," the author explained. Lehane, whose roots in the rough Dorcester neighborhood of South Boston (birthplace of people as varied as casino magnate Sheldon Adelson, mob boss Whitey Bulger and actor Mark Wahlberg) showed not only in the content of the chapter he read, but also in his subtle pronunciation of "the bahs of the prison cell," as well as in his clothing choice -- a well-worn black leather jacket over a black hoodie. During the question and answer session he spoke of reading the books of fellow crime novelist Elmore Leonard. Leonard's books, set in Detroit, made Lehane realize that he could write urban crime novels also, novels which took as their characters working-class people like the neighbors and friends with whom he grew up. Lehane spoke about what he has learned during his 18-year career as a novelist. He has taught fiction-writing classes at both Harvard University and his Alma Mater, Eckerd College, in St. Petersburg, Fla.
"Here's the thing I tell students, and if you're an undergrad and you're 19, you don't care about this. It takes 10 years to learn how to do this. It takes 10 years to apply yourself to this ... . The first time you write a book, you don't know what you're doing, [if you have success] you get lucky." He said that the old adage about "writing what you know" can be easily misunderstood. It does not mean writing about your life, but rather writing about what you know of human nature and how people interact. "I've never written anything about my life story," he said. "I was a white kid that went to college. End." Lehane said that he feels some guilt at the success he's had, while others from his neighborhood have floundered in life, or worse. He attributes his success to his parents. "I grew up in a tough town," he said. "Super tough. One of the worst neighborhoods of [Boston]. The people I grew up with, they didn't all go to jail, but a lot of them ended up in rehab. I won the parental lottery. [My parents] weren't touchy-feely, they didn't talk about your problems. They were determined to lay down a structure for us kids. And that was the difference ... . I watched so many people not make it and I have survivor's guilt because of that. The only difference between me and my friend who died of a heroin overdose two years ago is parents," he said. His success has been astounding. Eight of his 10 novels have become best sellers, with three of them, "Mystic River," "Gone Baby Gone," and "Shutter Island," adapted into blockbuster films. Lehane gave some insight into what success and the movie industry is like for an author, and shared that the rights to "Live by Night" were sold to a movie studio six months ago. "I assume that I know what I'm doing at this point, and I know [the studios] are going to come calling because Hollywood only knows the rule of success. Hollywood says, `I don't know what he knows, but he knows it.' This book was sold six months ago." Responding to a question from the audience, he said that he does not try to have any input in the filming process, though he makes himself available if people want to ask him questions. He shared an anecdote about his experience during the filming of the movie "Mystic River." "Clint Eastwood consulted me about casting. He said, `So, who are you thinking about casting for Jimmy?' I said Russell Crowe. He said, `I just hired Sean Penn.' I said, `OK then,'" he remembered, laughing. After the question and answer session, Lehane sat down at a folding table to sign copies of his 402-page novel for the excited fans who lined up, books in hand.